American Pharoah and his jockey, Victor Espinoza, have secured the world’s attention. But, American Pharoah didn’t get off to a smooth start with his racing career. The only race in which he was defeated was his first, where he appeared anxious, responding to commotion and reacting negatively to the blinker hood he was wearing. He finished fifth. Baffert removed the blinker hood for the next race and stuffed cotton in his ears to eliminate distraction. They spent weeks training him in the track paddock before bringing him back to the Del Mar Futurity in Del Mar, California . Here, with Espinoza jockeying, American Pharoah captured his first victory, displaying over a six length margin and catching the attention of the racing world. The three races of the Triple Crown happen in quick succession in May and June of each year. Winning all three of the races is something many aspire to and few accomplish. Elusive elements have to work together – A powerful horse with potential, a seasoned jockey with strategy, a knowledgeable trainer with intuition and a bit of luck. Starting with the Kentucky Derby the first Saturday in May in Louisville, Kentucky, a maximum of 20 horses run the mile and a quarter length race at Churchill Downs. Churchill Downs is the world’s most legendary race track and the Derby is the only one of the three Triple Crown races to have been run continuously, with no interruptions, and at its current location since 1875. The Kentucky Derby has been called the most exciting two minutes in sports and draws over 150,000 attendees each year. American Pharoah won his first race of the Triple Crown on May 2nd, 2015, by a single length, with a time of two minutes and three seconds. Only two weeks later, eight horses took on the mile and three-sixteenths race at the Preakness Stakes in Baltimore, Maryland. This race at Pimlico Race Course is the shortest of the three races and typically separates the horses who have the stamina to complete for the Triple Crown from the rest of the pack, due to the short recovery period that comes between it and the Kentucky Derby. Pimlico is the second oldest race track in America and comes weathered in tradition and inspiration. On May 16th, American Pharoah finished a full seven lengths in front of the second place horse with a time of one minute, fifty-eight seconds. Finally, the longest of the three races, the Belmont Stakes, takes place at Belmont Park in Elmont, New York, just three weeks after the Preakness. In this final race, no more than 16 horses run the furthest they will likely run at any point in their lives a mile and a half. The Belmont Stakes race is the oldest of the three races that make up the Triple Crown. On June 6th this year, American Pharoah finished in two minutes, twenty-six seconds and five and a half lengths in front of the next runner, thus winning the Triple Crown and ended the thirty-seven year drought. Winning the Triple Crown is not just about speed. The short rest time between each race is one of the major factors that has stolen Triple Crown glory from promising horses throughout history. Many fail to bring their best to all three races because they are unable to recover in such a short time. Recovery, strategy and training all play their own, major role and present their own challenges. In over 100 years of racing, 23 horses have had the chance to win the Triple Crown and only half of those have done so. Many have lost their chance to make history because of simple missteps. Running the horse too fast at the start of the Belmont Stakes, letting fatigue set in during the final stretch, and false starts have all dashed the dreams of Triple Crown hopefuls. The intuition, dedication and methodology of horse racing distinguishes the best trainers from the rest, and Bob Baffert has shown himself to be one of the best. Baffert adds four Kentucky Derby wins, six Preakness Stakes wins and two Belmont Stakes wins to his ten Breeders’ Cup wins and two Dubai World Cup wins. All climaxing with this years Triple Crown. 2015 wasn’t the first year that Baffert had an open gate to the Triple Crown. American Pharoah was his fourth attempt. Silver Charm in 1997, Real Quiet in 1998, and War Emblem in 2002 each finished first in the first two races of the Triple Crown. Silver Charm and Real Quiet placed second in the final race, delaying Baffert’s attempts at the high honor in 1998 by less than a nose. Besides breaking the drought of Triple Crown winners, American Pharoah has broken other records in the racing world. American Pharoah was the betting favorite for the Belmont Stakes with over 94,000 bets placed on the then-hopeful to win. More than 90,000, over 90 percent, are still holding on to their $2 bets from Belmont, potentially the largest number of bets sitting un-cashed in history. Turning in the ticket gives the holder $3.80 in winnings while holding on to it may prove to be a wiser investment. Prior to the race, tickets were selling online for over $100, and post-race sales are still well above the cash-in amount. Some predict that tickets turned collectors items will return the highest possible value. 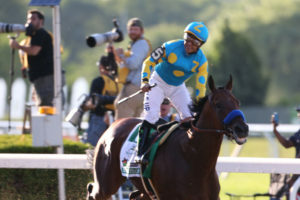 Winning the Triple Crown may be enough for some trainers and owners who would set their horse to stud after such a feat, but to the excitement of many, American Pharoah is currently poised to come back and run in the Breeders’ Cup in October and perhaps even the Travers Stakes at Saratoga prior to that. The break between races to recover from the physical challenge of the Triple Crown provides a dramatic pause and heightens anticipation around the horses next race. The ongoing legacy of American Pharoah comes with reports that stud rights have already been sold by owner Ahmed Zayat to Coolmore Ashford Stud for upwards of $20 million. Coolmore Ashford could charge between $175,000 and $200,000 or more in stud fees, quickly earning back their investment and giving racing fans another stunning colt to bet on.